The medical profession has a tough task in trying to combat obesity. It’s not simple. It’s costly and it’s frustrating. As a nutritionist, I’m personally frustrated. We need to be more creative in our approach. We need to champion smart people and organizations to work with people (not patients) to move in the right direction. We need to listen more. Talk less. We also need to work as teams. Straightforward communication is key. Recently a client shared a handout of directions from his new doctor about what he NEEDED TO DO to lose weight. 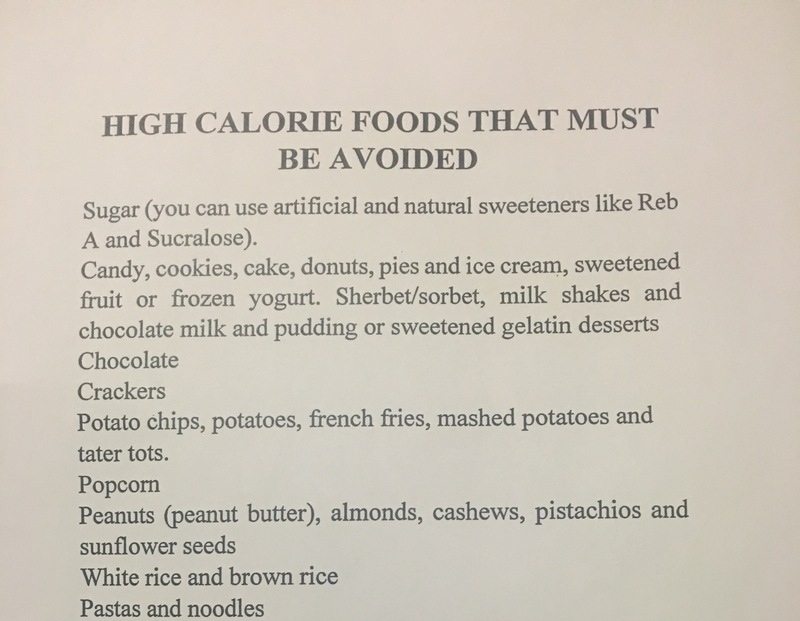 It was a list of high calorie foods to be avoided at all costs. Or he’d fail. The list was a slash and burn of foods, many of them nutrient-dense and real foods that any trained nutrition professional would include in daily in a sound weight loss plan. It also included one line about how it was ok to have artificial sweeteners (really?, that’s not even food, but go ahead, have all you want). It was a typed list, New Times Roman font, totally uninspiring and didactic, like the kind of handout you get for a colonoscopy prep. Everyone gets the same one. You either succeed or fail. Follow the list. FOLLOW THE LIST. See you in six months. Here’s the thing that really gets me. This client has been doing incredibly well with his weight loss and lifestyle goals. We’ve been working together weekly through video sessions. We check in about what’s going well and what’s not. We set goals, together, but mostly he does the goal setting and I give him advice to balance it all out. We talk about a new food to try each week. Real food. Real cooking. Recipes. Walking. Shooting a few hoops. Doing things he enjoys. Things he’s never done before. Things he never thought he could do before. Did the doctor ask him about that? Did he ask him about his success? How he felt? No, just treated him as another number and handed him the paper of what he must do. This simple piece of paper just reduced 11 months of our hard work to a second guess. So, yeah, I’m frustrated. We can do better. We must do better. Let’s get back to listening more and fostering real relationships, inspiring ones. That’s how we’ll make changes that last a lifetime.